Fluorescent bulbs are available in cool 6500 Kelvin, best for vegetative plant growth, and 3000 Kelvin, for blooming growth. They can also be combined in a single fixture for full spectrum lighting. 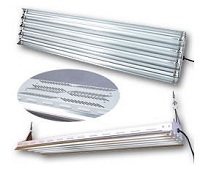 Wherever you use fluorescent grow lights, standard bulbs won't get the job done. High Output fluorescent bulbs, either straight line or compact fluorescent, are designed specifically for the needs of indoor gardeners.